At fifteen, Kit Cavendish is one of the oldest evacuees to escape London at the start of the Second World War due to a long term illness that sees her stuck in a wheelchair most of the time. But Kit has an extraordinary psychic power: she can put herself into the minds of others, see through their eyes, feel their emotions, even talk to them - though she dares not speak out for fear of her secret ability being exposed. There are secrets to be uncovered, both at home and abroad, and it's up to Kit and Henri to come together and fight their own battles in the depths of the world's greatest war. In the weeks leading up to his sixteenth birthday, gifted psychic Leighton Cavendish finds himself suddenly packed off to Blackpool, a glittering, teenage paradise filled with plenty of opportunities for amusement-and trouble. 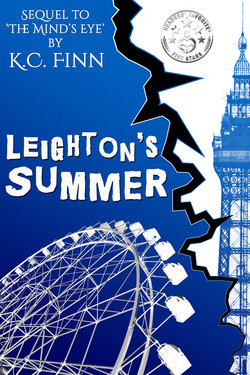 With only a preoccupied grandmother to keep an eye on him, Leighton's desperation for adventure leads him out into a world of holidaymakers, candy, and carnival rides-the ideal place to spend six weeks away from home. But Leighton's psychic visions are encroaching on his fun, trying to warn him of the danger that lurks beyond the shimmering lights of the Golden Mile. Who are the mysterious thieves Leighton sees in his head, and what do they want with the children they seek? A girl called Faye holds the answer, but she has enough problems of her own. Amid the climate of a tourist town recovering from the impact of the Second World War, two lost teenagers will discover a shocking truth about human greed. Together, they will try to fight against it. For Leighton and Faye, this will be a summer to remember-one filled with challenges that must be overcome.